Van Holkema & Warendorf, Amsterdam. Dolfuss-Miegs & Co, Mulhouse - Belfort. 32 planches of two-color embroideries. This edition is so old that there's no color print. Later editions have the same designs in red and blue. From the collection of Franciska Ruessink, scanned and edited by herself. Mulhouse, Dollfus-Mieg & Cie, [c.1900, ?, most pages missing]. Scans donated by Dindi Gelfi, not edited. Cross-stitch alphabets, monograms, borders, modern transportation images. Scans donated by Dindi Gelfi, edited by Judith Adele. Scans donated by Judith Adele, not edited. Mulhouse, Dollfus-Mieg & Cie, [c.1895], 103 pgs. Instructions and traditions, insertions in linen, additional embroidery and two intricate tassels. Lettres, Chiffres, Monogrammes et Ornements à points comptés suivis d'une série de modèles avec calques pour Broderie de blanc. Mulhouse, Dollfus-Mieg & Cie, [c.1890], 149 pgs. Cross-stitch, charted embroidery � alphabets, borders, medallions, monograms, naval and heraldic, hunting , winter scenes, white work monograms. D.M.C. Embroidery on Net [The Net Book]. Mulhouse, Dollfus-Mieg & Cie, [c.1895], 58 pgs. Making and mounting net, the embroidery stitches. Beautiful colored plates detailed enough to follow the stitches, charted patterns. D.M.C. Punto di Marca 1a Serie. Mulhouse, Dollfus-Mieg & Cie, [first pub. c.1895, 12 patterns]. Needlepoint or cross stitch patterns for alphabets, borders, hot air balloons, auto, boats, bicycles. Scanned by Dindi Gelfi, edited by Judith Adele. Mulhouse, Dollfus-Mieg & Cie, [c.1900], 63 pgs and 7 linen patterns. One of the classics of Irish Crochet lace. Parts of this book have been reprinted by several publishers. These scans are from the original, with all the chapters, plates and linen patterns. Instructions for Irish Crochet stitches and techniques, patterns for traditional Irish Crochet motifs, grounds, footings and borders, instructions for working with machine made grounds and braids, illustration plates and lacemaker�s patterns for working complex laces - deep edgings, squares, insertions, a collar and cuffs. Scans donated by Judith Adele and Melanie Gill, edited by Judith Adele. Mulhouse, Dollfus-Mieg & Cie, [c.1905], approx.25 pgs. More stunning art nouveau and Provençale charted cross-stitch designs � birds, bees, cats, bunnies, flowers, fish. Mulhouse, Dollfus-Mieg & Cie, [c.1905], approx.25 pgs, in French. Stunning art nouveau and Provençale charted cross-stitch designs � the Dutch children designs were possibly inspired by the 1901 Paris Exposition. Mulhouse, Dollfus Mieg & Cie, [c.1895], [~ 34 pgs]. French language manual for Teneriffe lace, a needle lace worked on foundations wrapped on round or bar-shaped forms, then overstitched. Inclues unusual scalloped forms. Scans donated by Sytske Wijnsma, edited Judith Adele. Mulhouse, Dollfus Mieg & Cie, [first pub. c.1890, subsequent printings have updated patterns], 12 plates. Cross-stitch charts for alphabets, monograms, borders, and a wonderful transportation scene. Motifs de Broderie copte, Deuxieme Partie. Mulhouse, Dollfus-Mieg & Cie, [c.1890], [~35 pgs.]. Clear illustrations of the special embroidery stitches and illustration plates of intricate abstract designs. Mulhouse, Dollfus-Mieg & Cie, [c.1895, approx. 85 pgs]. 60 plates of elegant alphabets, monograms and crests, with some instructions. Mulhouse, Dollfus Mieg & Cie, [c.1905], approx 98 pgs. Excellent instructions on preparing and couching the lace patterns, which are then covered with fine buttonhole stitches, and Reticella, using pre-made braids. The patterns in back are on special soft black paper with white tracings. Mulhouse, Dollfus Mieg & Cie, [unk date], 16 plates. More wonderful art nouveau (leaning here toward art deco) designs. Scans donated by Anja Riemens-Wildschut, edited Judith Adele. Mulhouse, Dollfus Mieg & Cie, [c.1925, approx 22 pgs, covers and ads not incl]. Complete instructions on how to do filet crochet, with simple and lovely patterns and a few filet charts. Scans donated by Bhavani Harikrichnan, edited by Bhavani Harikrichnan. D.M.C. Drawn Thread Work . Mulhouse, Dollfus Mieg & Cie, [c.1925, approx 40 pgs, covers and ads not incl.]. Directions for drawn thread embroidery - exquisite lace. Slav, Italian, Reticella openwork, Spanish openwork, cut stitch designs, and a ground with rosettes resembling Teneriffe. Mulhouse, Dollfus Mieg & Cie, [c.1890] 76 pgs. + plates and patterns. Needle laces made with manufactured tapes and braids (many no longer available) that work up quickly to stunning results. The linen patterns tracing patterns can also be used by Battenberg and Romanian Point lacemakers. Mulhouse, Dollfus Mieg & Cie, [c.1900], [approx 45 pgs]. Embroidery on tulle with clear illustrations and plates, some in vivid colors. Motifs de Broderie copte, Première Partie. Mulhouse, Dollfus Mieg & Cie, [c.1895, approx 60 pgs.]. Clear illustrations of simple embroidery stitches that quickly progress to patterns of dazzling complexity. 30 plates, many with thread count notes. Mulhouse, Dollfus Mieg & Cie, [orig pub c.1890, 1908 edition], 12 plates. Charts for alphabets, borders, monograms, and wonderful scenes of 1908 bicycles, boats, trains, motor car and balloons. D.M.C. Album für Kreuzstichstickerei II. Mulhouse, Dollfus Mieg & Cie, [c.1890, approx 120 pgs.]. Dozens of different cross stitches collected from many parts of the world, beautifully illustrated, with some needle lace stitches for joinings, edges and tassels, plus 39 colored plates. The centerfold patterns are reproduced full size in the last pdf file. D.M.C. Broderie au passé, La . Mulhouse, Dollfus Mieg & Cie, [c.1900], [35 pgs] plus the text pages from the German edition. Flat-stitch embroidery plates and pattern outlines for graceful floral and formal pieces. Cross stitch patterns for art deco alphabets, fields, borders, animals and sceneries, including wonderful insects, fish and birds. Scans donated by Annick Chartier, edited by Judith Adele. Mulhouse, Dollfus-Mieg & Cie, [first pub. c.1900, approx 35 pgs]. Italian language release of DMC freehand-drawn surface embroidery collection. Stitch direction, plus full color photographs of borders, insertions, corners, all-over designs. Some in metallic threads. Line drawings of all photographed designs are included. More stunning art nouveau and Provençale charted cross-stitch designs � birds, fish, flowers and leaves, children's scenes. Scans donated by Sytske Wijnsma, redrawn by Sytske Wijnsma. Mulhouse, Dollfus-Mieg & Cie, [c.1910, 28 pgs]. Plates illustrating beautiful early 20th C embroidery design. Scans donated by Bhavani Harikrichnan, not edited. Scans donated by Bhavani Harikrichnan, edited by Judith Adele. German language treasury of charted motifs, all-over grounds, and strip patterns intended for embroidery/darning on net, many adapted from historical museum examples. Diagrams in black and white, but imply multiple colors. Stitch direction and type shown. Can be adapted for pattern darning, cross-stitch, voided work (Assisi embroidery), beadwork, and other graph-reliant styles. Second book of a series. Mulhouse, Dollfus-Mieg & Cie. c.1895, 25 pgs. Color photographs of floral and geometric borders and motifs. Most are intended for counted thread embroidery. No charts. Scans donated by Bhavani Harikrishna, edited by Judith Adele. Mulhouse, Dollfus-Mieg & Cie, [c.1900, ~56 pgs]. Instructions for embroidery and needle lace stitches, and plates illustrating geometric borders, grounds, linens, fringed edgings, pillows, collars, apron, bags, blouses. Mulhouse, Dollfus-Mieg & Cie, [c.1947, 19 pgs]. French language booklet illustrating designs for counted thread, pattern darning, and canvaswork embroidery. Geometric motifs, borders, and all-over designs in multiple colors. No charts, but photos are clear enough to work from. Some Florentine canvaswork (flame stitch) suitable for needlepoint. Mulhouse, Dollfus-Mieg & Cie, [c.1920, 30 pgs]. Bulgarian embroidery - dozens of illustratios of brilliant borders and fields, with instructions for materials and thread colors and illustration of unusual stitches. D.M.C. ABC de la Couture. Mulhouse, Dollfus-Mieg & Cie, [c. 1940, 20 pgs]. French language instruction for basic plain sewing, embroidery, and mending. Includes illustrations of stitches, plus a simple graphed alphabet for marking household linens in cross-stitch. D.M.C. Ornaments et lingerie d'Église. Mulhouse, Dollfus-Mieg & Cie., [c.1935, 32 pgs]. Embroidery designs for church vestments and alter linens, with instructions, plates showing the embroidery and some tracing patterns. German language treasury of charted motifs, all-over grounds, and strip patterns intended for embroidery/darning on net, many adapted from historical museum examples. Diagrams in black and white, but imply multiple colors. Stitch direction and type shown. Can be adapted for pattern darning, cross-stitch, voided work (Assisi embroidery), beadwork, and other graph-reliant styles. First book of a series. Charted multicolor designs, including alphabets, monograms, all-over grounds, borders, square and diamond motifs, stylized folk art flowers, charming scenes of village life; Some designs incorporate straight stitches in addition to block units. Intended for cross-stitch, some designs can be adapted for needlepoint or Berlin woolwork. Mulhouse, Dollfus-Mieg & Cie, [c.1925, ? pgs, patterns missing]. Colorful Bosnian, Herzegovine, Dalmation, and Montenegro embroidery. Stitch instructions and materials, and color plates. A wide variety of stylized floral, bird and abstract designs in gorgeous colors, with tracing patterns at the back of the book for pricking the designs onto cloth. D.M.C. Alphabets et Monogrammes . Mulhouse, Dollfus-Mieg & Cie, [c.1925, 32 pgs]. French language instruction for monogramming linen and lingerie, includes lessons on composition and placement, plus 9 pages of freehand drawn monograms for surface embroidery, and 7 pages of charted alphabets for cross-stitch. Very Art Deco in style. Mulhouse, Dollfus-Mieg & Cie, [c.1900, 38 pgs.]. Instructions and illustrations of many embroidery stitches, lavish color plates illustrating the designs, and tracing patterns at the back of the book for pricking the patterns onto cloth. Mulhouse, Dollfus-Mieg & Cie, c. 1940, 24 pgs. French language introductory knitting techique instruction: basic stitches, turning heels, finishing toes; textured and lacy knitting stitches; simple square and round motifs for doilies or blankets; and a border. Instructions for making net, and the stitches to embroider over it, to make elaborate squares and borders. Plates with bird, flower and geometric designs. Mulhouse, Dollfus-Mieg & Cie, [c.1920, 28 pgs]. French language instructions for Guipre needle lace embroidery on large mesh knotted net, including working methods for stitches and fills, plus photos of grounds, borders (some with corners) and small motifs. Mulhouse, Dollfus-Mieg & Cie, [c. 1940, 28 pgs]. French language introductory crochet techique instruction: basic stitches and methods; simple square and octagon; grounds, border/insertions, and edgings. Forming picots, and a round lacy motif; simple rectangular piece with granny-style deep edging. Cross stitch charts for alphabets, borders and children's play scenes. Mulhouse, Dollfus-Mieg & Cie, [c.1920, 50 pgs]. Colorful Serbian, Croatian and Slovenian embroidery. Stitch instructions and materials, and color plates. A wide variety of mostly geometric or stylized floral designs in gorgeous colors, with tracing patterns at the back of the book for pricking the designs onto cloth. Mulhouse, Dollfus-Mieg & Cie, [c. 1905, 22 pgs]. Mulhouse, Dollfus-Mieg & Cie, [c.1921, 40 pgs]. Instructions for the embroidery and needle lace stitches, and plates illustrating geometric borders, grounds, linens, fringed edgings, pillows, collars, apron, bags, blouses. Instructions for the embroidery and needle lace stitches, and plates illustrating geometric borders, grounds, fringed and knotted edgings, pillows, bags and an apron. D.M.C. La Soutache et Son Emploi. Instructions and illustrations for stitching manufactured braid in elaborate patterns onto fabric, with many illustrations and tracing patterns. Beautiful art nouveau design. Mulhouse, Dollfus-Mieg & Cie, [c.1915 ?, ~20 pgs.]. Multicolor designs for counted thread embroidery (not cross-stitch), including florals, all-over grounds, medallions, borders (some with corners) and rectagular pieces. Style is very much pre WWII modernist. Works are shown as photos of stitching, not graphs. Carefully researched patterns and stitches from museums of Bohemia, Moravia and Slovakia - lavish flat stitching. cross stitch and cutwork. Mulhouse, France, Dollfus-Mieg & Cie [c.1930? ~46pgs). Moroccan and Moorish design with a discussion of needlework styles in different regions. Instructions for the unique stitches, gorgeous color plates, pattern tracings and charts. Cross stitch, flat stitching, ground stitches. Mulhouse, France, DMC Library, 1978, 48 pgs. 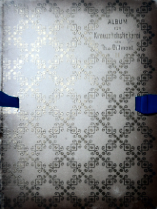 Book on loan from Sytske Wijnsma, scanned and edited by Judith Adele. French language collection of counted thread designs for traditional folk and historical embroidery, presented as engravings detailed enough to use as charts. Some have notes on multicolor execution. Includes all-over designs, strips for insertions and borders (some with corners), some incorporating straight stitches (double running or back stitch). Also sampler style alphabets, and a few stand-alone motifs. Instructions describe stitches including two-sided cross-stitch, but do not include source notes for the patterns. Scans donated by Ivan Kra�njak, edited by Judith Adele. Not charted yet. Scans donated by Sytske Wijnsma, not edited yet. Dillmont, Th. de, ed. D.M.C. Beautiful Norwegian white-on-white openwork, with excellent instructions and patterns ranging from simple embroidery to complex laces. New Patterns in Old Style, First Part. Alsace, Th. de Dillmont, [c.1890, 42 pgs]. Crochet and knitting patterns, Venetian, Flat stitch, Persian, cross stitch, and appliqué embroidery, rug making, needle lace, macramé. New Patterns in Old Style, Second Part. Alsace, Th. de Dillmont, [c.1890], 48 pgs. Raised lace, appliqué, reticella, gobelin, crochet, cut knotted stitching, Holbein and Viennese cross stitch, tapestry and madeira work, Spanish and gold embroidery.